Are Vlasic Pickles Gluten Free? Are Vlasic Pickles® Gluten Free? Question: Are Vlasic Pickles® Gluten Free? 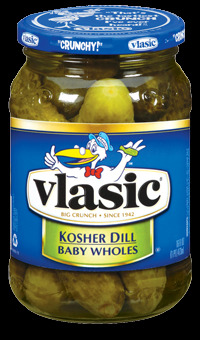 Answer: Yes, Vlasic Pickles® are gluten free, kosher and they do not contain MSG. However, please check the individual packages label, ingredients may change. This menu is provided by TheGlutenFreeMenu.com as of 2014. The Gluten Free Menu is not associated with Vlassic Pickles® Please check with the listed company before consuming any food items. We are not responsible for any information that is incorrect. This menu is only a guide and it should not be relied upon without checking with the local branch of the business. Are Advil Gluten Free? - No Not All Avvil are Gluten Free. Answer: Advil® Film-Coated do not contain gluten. However, Gluten is not added to Advil® Film-Coated products during the manufacturing process. However, they cannot guarantee that minute amounts of gluten or gluten derivatives are not contained in raw materials obtained from various suppliers for in their manufacturing process since the end product is not tested for gluten. Also, Advil® Liqui-Gels® and Advil® Migraine and contain a wheat derivative, and are Not gluten-free. This menu is provided by TheGlutenFreeMenu.com as of 2014. The Gluten Free Menu is not associated with Advil® Please check with the listed company before consuming any food items. We are not responsible for any information that is incorrect. This menu is only a guide and it should not be relied upon without checking with the local branch of the business.